Written in the tradition of Margaret Atwood’s The Handmaid’s Tale or James Howard Kunstler’s World Made by Hand, the people of Minnesota Cold live in a society a few decades from now when an unholy collaboration of government and large corporations creates a rogue country holding unfortunate power. Daily living has returned to something closely resembling life before a Middle East nuclear event disrupted the world environment, communications and commerce. An unlikely hero steps forward to ask difficult questions before a generation disappears with its memories of civil disobedience and personal accountability. 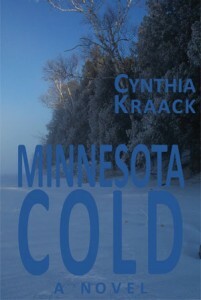 Even readers who have never visited the science fiction section of their favorite book seller will find Minnesota Cold a comfortable read with its strong family of characters. This debut novel will provoke discussion in book clubs or classrooms. Click here for a podcast of a reading at the University of Minnesota.